The Nintendo DS,[b] or simply DS, is a dual-screen handheld game console developed and released by Nintendo. The device released globally across 2004 and 2005. 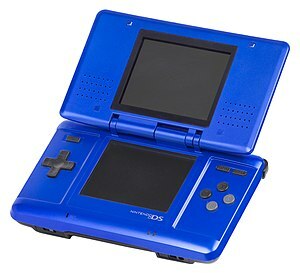 The DS, short for "Developers' System" or "Dual Screen", introduced distinctive new features to handheld gaming: two LCD screens working in tandem (the bottom one featuring a touchscreen), a built-in microphone, and support for wireless connectivity. Both screens are encompassed within a clamshell design similar to the Game Boy Advance SP. The Nintendo DS also features the ability for multiple DS consoles to directly interact with each other over Wi-Fi within a short range without the need to connect to an existing wireless network. Alternatively, they could interact online using the now-defunct Nintendo Wi-Fi Connection service. Its main competitor was Sony's PlayStation Portable during the seventh generation of video game consoles. It was likened to the Nintendo 64 from the 1990s, which led to several N64 ports such as Super Mario 64 DS and Diddy Kong Racing DS, among others. Prior to its release, the Nintendo DS was marketed as an experimental, "third pillar" in Nintendo's console lineup, meant to complement the Game Boy Advance and GameCube. However, backward compatibility with Game Boy Advance titles and strong sales ultimately established it as the successor to the Game Boy series. On March 2, 2006, Nintendo launched the Nintendo DS Lite, a slimmer and lighter redesign of the original Nintendo DS with brighter screens. On November 1, 2008, Nintendo released the Nintendo DSi, another redesign with several hardware improvements and new features. All Nintendo DS models combined have sold 154.02 million units, making it the best selling handheld game console to date, and the second best selling video game console of all time behind Sony's PlayStation 2. The Nintendo DS line was succeeded by the Nintendo 3DS family in 2011, which maintains backward compatibility with nearly all Nintendo DS software. Development on the Nintendo DS began around mid-2002, following an original idea from former Nintendo president Hiroshi Yamauchi about a dual-screened console. On November 13, 2003, Nintendo announced that it would be releasing a new game product in 2004. The company did not provide many details, but stated it would not succeed the Game Boy Advance or GameCube. On January 20, 2004, the console was announced under the codename "Nintendo DS". Nintendo released only a few details at that time, saying that the console would have two separate, 3-inch TFT LCD display panels, separate processors, and up to 1 gigabit (128 Megabytes) of semiconductor memory. Nintendo president Satoru Iwata said, "We have developed Nintendo DS based upon a completely different concept from existing game devices in order to provide players with a unique entertainment experience for the 21st century." He also expressed optimism that the DS would help put Nintendo back at the forefront of innovation and move away from the conservative image that has been described about the company in years past. In March 2004, a document containing most of the console's technical specifications was leaked, also revealing its internal development name, "Nitro". 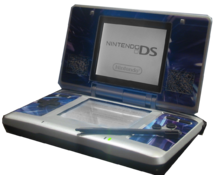 In May 2004, the console was shown in prototype form at E3 2004, still under the name "Nintendo DS". On July 28, 2004, Nintendo revealed a new design that was described as "sleeker and more elegant" than the one shown at E3 and announced Nintendo DS as the device's official name. Following lukewarm GameCube sales, Hiroshi Yamauchi stressed the importance of its success to the company's future, making a statement which can be translated from Japanese as, "If the DS succeeds, we will rise to heaven, but if it fails we will sink to hell." The Nintendo DS was launched in North America for US$149.99 on November 21, 2004; in Japan for JP¥15,000 on December 2 in the color "Titanium" . Well over three million preorders were taken in North America and Japan; preorders at online stores were launched on November 3, and ended the same day as merchants had already sold their allotment. Initially Nintendo planned to deliver one million units combined at the North American and Japanese launches; when it saw the preorder numbers, it brought another factory online to ramp up production. Nintendo originally slated 300,000 units for the U.S. debut; 550,000 were shipped, and just over 500,000 of those sold through in the first week. Later in 2005, the manufacturer suggested retail price for the Nintendo DS was dropped to US$129.99. Both launches proved to be successful, but Nintendo chose to release the DS in North America prior to Japan, a first for a hardware launch from the Kyoto-based company. This choice was made to get the DS out for the largest shopping day of the year in the U.S. (the day after Thanksgiving, also known as "Black Friday"). Perhaps partly due to the release date, the DS met unexpectedly high demand in the United States, selling 1 million units by December 21, 2004. By the end of December, the total number shipped worldwide was 2.8 million, about 800,000 more than Nintendo's original forecast. At least 1.2 million of them were sold in the U.S. Some industry reporters are referred to it as "the Tickle Me Elmo of 2004". In June 2005, Nintendo informed the press that a total of 6.65 million units had been sold worldwide. A Nintendo DS, skinned in blue. As is normal for electronics, some were reported as having problems with stuck pixels in either of the two screens. Return policies for LCD displays vary between manufacturers and regions, however in North America, Nintendo has chosen to replace a system with fixed pixels only if the owner claims that it interferes with their gaming experience. There are currently two exchange programs in place for North America. In the first, the owner of the defective DS in question must provide a valid credit card number and, afterwards, Nintendo will ship a new DS system to the owner with shipping supplies to return the defective system. In the second, the owner of the defective DS in question must ship their system to Nintendo for inspection. After inspection, Nintendo technicians will either ship a replacement system or fix the defective system. The first option allows the owner to have a new DS in 3–5 business days. Multiple games were released alongside the DS during its North American launch on November 21, 2004. At launch there was one pack-in demo, in addition to the built-in PictoChat program: Metroid Prime Hunters: First Hunt (published by Nintendo and is a demo for Metroid Prime Hunters, a game released in March 2006). At the time of the "Electric Blue" DS launch in June 2005, Nintendo bundled the system with Super Mario 64 DS. In Japan, the games were released at same time as the system's first release (December 2, 2004). In the launch period, The Prince of Tennis 2005 -Crystal Drive- (Konami) and Puyo Puyo Fever (Puyo Pop Fever) (Sega) were released. The DS was released in Europe on March 11, 2005 for €149. A small supply of units were available prior to this in a package with a promotional "VIP" T-shirt, Metroid Prime Hunters - First Hunt, a WarioWare: Touched! demo, and a pre-release version of Super Mario 64 DS, through the Nintendo Stars Catalogue; the bundle was priced at £129.99 for the UK and €189.99 for the rest of Europe, plus 1,000 of Nintendo's "star" loyalty points (to cover postage). As of 23 January 2006[update], 1 million DS units had been sold in Europe, setting a sales record for a handheld console. The European release of the DS, like the U.S., was originally packaged with a Metroid Prime Hunters: First Hunt demo. The European packaging for the console is noticeably more "aggressive" than that of the U.S./Japanese release. [clarification needed] The European game cases are additionally about 1/4 inch thicker than their North American counterparts and transparent rather than solid black. Inside the case there is room for one Game Boy Advance game pak and a DS card with the instructions on the left side of the case. The DS launched in Australia and New Zealand on February 24, 2005. It retailed in Australia for A$199 and in New Zealand for NZ$249. Like the North American launch, it includes the Metroid Prime Hunters - First Hunt demo. The first week of sales for the system broke Australian launch sales records for a console, with 19,191 units sold by the 27th. "iQue DS", the official name of the Chinese Nintendo DS, was released in China on July 23, 2005. The price of the iQue DS was 980 RMB (roughly US$130) as of April 2006. This version of the DS includes updated firmware to block out use of the PassMe device, along with the new Red DS. Chinese launch games were Zhi Gan Yi Bi (Polarium) (Nintendo/iQue) and Momo Waliou Zhizao (WarioWare: Touched!) (Nintendo/iQue). Title North America Japan Europe Australia and N.Z. The Nintendo DS was seen by many analysts to be in the same market as Sony's PlayStation Portable, although representatives from both companies have said that each system targets a different audience. Time magazine awarded the DS a Gadget of the Week award. At the time of its release in the United States, the Nintendo DS retailed for US$149.99. The price dropped to US$129.99 on August 21, 2005, one day before the releases of Nintendogs and Advance Wars: Dual Strike. Nine official colors of the Nintendo DS were available through standard retailers. Titanium (silver and black) were available worldwide, Electric Blue was exclusive to North and Latin America. There was also a red version which was bundled with the game Mario Kart DS. Graphite Black, Pure White, Turquoise Blue, and Candy Pink were available in Japan. Mystic Pink and Cosmic Blue were available in Australia and New Zealand. Japan's Candy Pink and Australia's Cosmic Blue were also available in Europe and North America through a Nintendogs bundle, although the colors are just referred to as pink and blue; however, these colors were available only for the original style Nintendo DS; a different and more-limited set of colors were used for the Nintendo DS Lite. The Nintendo DS is backward compatible with Game Boy Advance (GBA) cartridges. The smaller Nintendo DS game cards fit into a slot on the top of the system, while Game Boy Advance games fit into a slot on the bottom. The Nintendo DS, like the Game Boy Micro, is not backward compatible with games for the Game Boy Color and the original Game Boy because the Sharp Z80 compatible processor is not included and the console has physical incompatibility with Game Boy and Game Boy Color games. The original Game Boy sound processor, however, is still included to maintain compatibility for GBA games that use the older sound hardware. The handheld does not have a port for the Game Boy Advance Link Cable, so multiplayer and GameCube–Game Boy Advance link-up modes are not available in Game Boy Advance titles. Only single-player mode is supported on the Nintendo DS, as is the case with Game Boy Advance games played via the Virtual Console on the 3DS and Wii U.
Nintendo DS games inserted into the top slot are able to detect the presence of specific Game Boy Advance games in the bottom slot. In many such games, either stated in-game during gameplay or explained in its instruction manual, extra content can be unlocked or added by starting the Nintendo DS game with the appropriate Game Boy Advance game inserted. Among those games were the popular Pokémon Diamond and Pearl or Pokémon Platinum, which allowed the player to find more/exclusive Pokémon in the wild if a suitable Game Boy Advance cartridge was inserted. Some of the content can stay permanently, even after the GBA game has been removed. Additionally, the GBA slot can be used to house expansion paks, such as the Rumble Pak, Nintendo DS Memory Expansion Pak, and Guitar Grips for the Guitar Hero: On Tour series. The Nintendo DSi and the DSi XL have an SD card slot instead of a second cartridge slot and cannot play Game Boy Advance games or Guitar Hero: On Tour. The Nintendo DS is region free in the sense that any console will run a Nintendo DS game purchased anywhere in the world; however, the Chinese iQue DS games cannot be played on other versions of the original DS, whose larger firmware chip contains the required Chinese character glyph images; this restriction is removed on Nintendo DSi and 3DS systems. Although the Nintendo DS of other regions cannot play the Chinese games, the iQue DS can play games of other regions. Also, as with Game Boy games, some games that require both players to have a Nintendo DS game card for multiplayer play will not necessarily work together if the games are from different regions (e.g. a Japanese Nintendo DS game may not work with a North American copy, even though some titles, such as Mario Kart DS and Pokémon Diamond and Pearl versions are mutually compatible). With the addition of the Nintendo Wi-Fi Connection, certain games can be played over the Internet with users of a different region game. The Nintendo DSi, however, has a region lock for DSiWare downloadable games, as well as DSi-specific cartridges. It still runs normal DS games of any region, however. Nintendo DS games use a proprietary solid state mask ROM in their game cards. The mask ROM chips are manufactured by Macronix and have an access time of 150 ns. Cards range from 8–512 MiB (64 Mib to 4 Gib) in size (although data on the maximum capacity has not been released). Larger cards have a 25% slower data transfer rate than more common smaller cards. The cards usually have a small amount of flash memory or an EEPROM to save user data such as game progress or high scores. However, there are few games that have no save memory, such as Electroplankton. The game cards are 35 mm × 33 mm × 3.8 mm (1.38 in × 1.30 in × 0.15 in) (about half the width and depth of Game Boy Advance cartridges) and weigh around 3.5 g (​1⁄8 oz). The lower display of the Nintendo DS is overlaid with a touchscreen designed to accept input from the included stylus, the user's fingers, or a curved plastic tab attached to the optional wrist strap. The touchscreen lets users interact with in-game elements more directly than by pressing buttons; for example, in the included chatting software, PictoChat, the stylus is used to write messages or draw. It also has stereo speakers providing virtual surround sound (depending on the software) located on either side of the upper display screen. This was a first for a Nintendo handheld, as the Game Boy line of systems had only supported stereo sound through the use of headphones or external speakers. A built-in microphone is located below the left side of the bottom screen. It has been used for a variety of purposes, including speech recognition, chatting online between and during gameplay sessions, and minigames that require the player to blow or shout into it. The Nintendo DS Lite (Japanese: ニンテンドーDS Lite) is the first redesign of the Nintendo DS. While retaining the original model's basic characteristics, it features a sleeker appearance, larger stylus, longer lasting battery and brighter screens. Nintendo considered a larger model of the Nintendo DS Lite for release, but decided against it as sales of the original redesign were still strong. It was the final DS to have backwards compatibility with Game Boy Advance games. As of March 31, 2014, shipments of the DS Lite have reached 93.86 million units worldwide, according to Nintendo. The Nintendo DSi (ニンテンドーDSi) is the second redesign of the Nintendo DS. It is based on the unreleased larger Nintendo DS Lite model. While similar to the previous DS redesign, new features include two inner and outer 0.3 megapixel digital cameras, a larger 3.25 inch display, internal and external content storage, compatibility with WPA wireless encryption, and connectivity to the Nintendo DSi Shop. The system's 3D hardware consist of Rendering Engine and Geometry Engine which perform transform and lighting, Transparency Auto Sorting, Transparency Effects, Texture Matrix Effects, 2D Billboards, Texture Streaming, texture-coordinate transformation, perspective-correct texture mapping, per-pixel Alpha Test, per-primitive alpha blending, texture blending, Gouraud Shading, cel shading, z-buffering, W-Buffering, 1bit Stencil Buffer, per-vertex directional lighting and simulated point lighting, Depth Test, Stencil Test, Render to Texture, Lightmapping, Environment Mapping, Shadow Volumes, Shadow Mapping, Distance Fog, Edge Marking, Fade-In/Fade-Out, Edge-AA. Sprite special effects: scrolling, scaling, rotation, stretching, shear. However, it uses point (nearest neighbor) texture filtering, leading to some titles having a blocky appearance. Unlike most 3D hardware, it has a set limit on the number of triangles it can render as part of a single scene; the maximum amount is about 6144 vertices, or 2048 triangles per frame. The 3D hardware is designed to render to a single screen at a time, so rendering 3D to both screens is difficult and decreases performance significantly. The DS is generally more limited by its polygon budget than its pixel fill rate. There are also 512 kilobytes of texture memory, and the maximum texture size is 1024 × 1024 pixels. Users can close the Nintendo DS system to trigger its 'sleep' mode, which pauses the game being played and saves battery life by turning off the screens, speakers, and wireless communications; however, closing the system while playing a Game Boy Advance game will not put the Nintendo DS into sleep mode, and the game will continue to run normally. Certain DS games (such as Animal Crossing: Wild World) also will not pause but the backlight, screens, and speakers will turn off. Additionally, when saving the game in certain games, the DS will not go into sleep mode. Some games, such as The Legend of Zelda: Phantom Hourglass even use the closing motion needed to enter sleep mode as an unorthodox way of solving puzzles. Looney Tunes : Duck Amuck has a game mode in which you need to close the DS to play, helping Daffy Duck hunt a monster with the shoulder buttons. Although the secondary port on the Nintendo DS does accept and support Game Boy Advance cartridges (but not Game Boy or Game Boy Color cartridges), Nintendo emphasized that the main intention for its inclusion was to allow a wide variety of accessories to be released for the system. The Nintendo DS Headset is the official headset for the Nintendo DS. It plugs into the headset port (which is a combination of a standard 3.5 mm (1/8 in) headphone connector and a proprietary microphone connector) on the bottom of the system. It features one earphone and a microphone, and is compatible with all games that use the internal microphone. It was released alongside Pokémon Diamond and Pearl in Japan, North America, and Australia. On February 15, 2006, Nintendo announced a version of the cross-platform web browser Opera for the DS system. The browser can use one screen as an overview, a zoomed portion of which appears on the other screen, or both screens together to present a single tall view of the page. The browser went on sale in Japan and Europe in 2006, and in North America on June 4, 2007. Browser operation requires that an included memory expansion pak is inserted into the GBA slot. The DSi has an internet browser available for download from the Nintendo DSi shop for free. This USB-flash-disk-sized accessory plugs into a PC's USB port and creates a miniature hotspot/wireless access point, allowing a Wii and up to five Nintendo DS units to access the Nintendo Wi-Fi Connection service through the host computer's Internet connection. When tried under Linux and Mac, it acts as a regular wireless adapter, connecting to wireless networks, an LED blinks when there is data being transferred. There is also a hacked driver for Windows XP/Vista/7/8/10 to make it function the same way. The Wi-Fi USB Connector was discontinued from retail stores. The Guitar grip controller comes packaged with the game Guitar Hero: On Tour and is plugged into the GBA game slot. It features four colored buttons like the ones found on regular Guitar Hero guitar controllers for the stationary consoles, though it lacks the fifth orange button found on the guitar controllers. The DS Guitar Hero controller comes with a small "pick-stylus" (which is shaped like a guitar pick, as the name suggests) that can be put away into a small slot on the controller. It also features a hand strap. The game works with both the DS Lite and the original Nintendo DS as it comes with an adapter for the original DS. The Guitar Grip also works with its sequels, Guitar Hero On Tour: Decades, Guitar Hero On Tour: Modern Hits, and Band Hero. Nintendo Wi-Fi Connection was a free online game service run by Nintendo. Players with a compatible Nintendo DS game could connect to the service via a Wi-Fi network using a Nintendo Wi-Fi USB Connector or a wireless router. The service was launched in North America on November 14, 2005 with the release of Mario Kart DS. Various online games and a web browser were released afterwards, with Nintendo later believing that the online platform's success directly propelled the commercial success of the entire Nintendo DS platform. The Nintendo Wi-Fi Connection served as part of the basis of what would become the Wii. Most functions (for games on both the DS and Wii consoles) were discontinued worldwide on May 20, 2014. With Download Play, it is possible for users to play multiplayer games with other Nintendo DS systems, and later Nintendo 3DS systems, using only one game card. Players must have their systems within wireless range (up to approximately 65 feet) of each other for the guest system to download the necessary data from the host system. Only certain games supported this feature and usually played with much more limited features than the full game allowed. Some Nintendo DS retailers featured DS Download Stations that allowed users to download demos of current and upcoming DS games; however, due to memory limitations, the downloads were erased once the system was powered off. The Download Station was made up of 1 to 8 standard retail DS units, with a standard DS card containing the demo data. On May 7, 2008, Nintendo released the Nintendo Channel for download on the Wii. The Nintendo Channel used WiiConnect24 to download Nintendo DS demos through it. From there, a user can select the demo he/she wishes to play and, similar to the Nintendo DS Download Stations at retail outlets, download it (until the user turns off the console) to their DS. PictoChat allows users to communicate with other Nintendo DS users within local wireless range. Users can enter text (via an on screen keyboard), handwrite messages or draw pictures (via the stylus and touchscreen). There are four chatrooms (A, B, C, D) in which people can go to chat. Up to sixteen people can connect in any one room. Nintendo's own firmware boots the system. A health and safety warning is displayed first, then the main menu is loaded. The main menu presents the player with four main options to select: play a DS game, use PictoChat, initiate DS Download Play, or play a Game Boy Advance game. The main menu also has secondary options such as turning on or off the back light, the system settings, and an alarm. The firmware also features a clock, several options for customization (such as boot priority for when games are inserted and GBA screen preferences), and the ability to input user information and preferences (such as name, birthday, favorite color, etc.) that can be used in games. Since the release of the Nintendo DS, a great deal of hacking has occurred involving the DS's fully rewritable firmware, Wi-Fi connection, game cards that allow SD storage, and software use. There are now many emulators for the DS, as well as the NES, SNES, Sega Master System, Sega Mega Drive, Neo-Geo Pocket, Neo-Geo MVS (arcade), and older handheld consoles like the Game Boy Color. ^ a b c d "Consolidated Sales Transition by Region" (PDF). Nintendo. April 27, 2016. Retrieved April 27, 2016. ^ "Sales Data — Top Selling Software Sales Units — Nintendo DS Software". Nintendo. March 31, 2015. Retrieved May 24, 2014. ^ "Nintendo DS Frequently Asked Questions". Nintendo. Retrieved July 8, 2014. ^ "Nintendo DS Line Outsells PlayStation 2, Nintendo Says". WIRED. Retrieved 2018-10-13. ^ Yamauchi, Hiroshi (February 13, 2004). "Nintendo DS Invented by Advisor Yamauchi - Interview". Game Online citing Nikkei Shimbun. ^ "Nintendo Going Back to the Basics. Full story about the company offering a new system in 2004". IGN. November 13, 2003. Retrieved October 4, 2007. ^ a b c "Nintendo Announces Dual-Screened Portable Game System". January 20, 2004. Archived from the original on April 2, 2004. Retrieved July 10, 2007. ^ Billy Berghammer (January 21, 2004). "GI Online Interviews NOA's Beth Llewelyn About The Nintendo DS". Archived from the original on June 12, 2007. Retrieved July 10, 2007. ^ Glen Bayer (March 1, 2004). "Various Satoru Iwata comments regarding the Nintendo DS". N-sider.com. Retrieved October 4, 2007. ^ Kavanagh, Rich (March 13, 2004). "More Nintendo DS (or Nitro?) specs leaked". Archived from the original on November 6, 2010. Retrieved July 13, 2007. ^ Kent, Steve (May 5, 2004). "Nintendo unveiling new portable". USA Today. Retrieved July 13, 2007. ^ "Nintendo keeps 'DS' codename, tweaks hardware". USA Today. July 28, 2004. Retrieved July 13, 2007. ^ Metts, Jonathan (February 13, 2004). "Iwata, Yamauchi Speak Out on Nintendo DS". Nintendo Worldwide Report. Retrieved May 27, 2014. ^ "Message from the President: To shareholders and investors". Investor Relations Information. Japan: Nintendo Co., Ltd. 2008. Archived from the original on December 21, 2008. Retrieved November 25, 2015. ^ Harris, Craig (September 20, 2004). "Official Nintendo DS Launch Details". Retrieved August 13, 2007. ^ "IGN: NDS Japanese Launch Details". Retrieved December 27, 2008. ^ "PALGN: Australian DS Launch". Archived from the original on May 25, 2009. Retrieved December 27, 2008. ^ "Nintendo claims most successful launch ever for DS in Australia". Retrieved December 27, 2008. ^ Gantayat, Anoop (December 1, 2004). "NDS Launches in Japan". Retrieved July 16, 2007. ^ Harris, Craig (January 27, 2007). "Europe DS Launch Title Details". IGN. Retrieved October 4, 2007. ^ "Nintendo reacts to DS demand; orders, share price on the rise". GameSpot.com. November 12, 2004. Retrieved October 11, 2012. ^ "Nintendo News, Previews, Reviews, Editorials and Interaction". Nintendojo.com. January 7, 2005. Retrieved October 11, 2012. ^ "Internet Archive Wayback Machine". Web.archive.org. February 23, 2005. Archived from the original on February 23, 2005. Retrieved October 11, 2012. ^ "Internet Archive Wayback Machine" (PDF). Web.archive.org. September 30, 2007. Archived from the original (PDF) on September 30, 2007. Retrieved October 11, 2012. ^ "Nintendo DS targets teens, young adults". November 15, 2004. Retrieved May 24, 2016. ^ Rothman, Wilson (June 14, 2006). "Time Magazine: Gadget of the Week". Retrieved February 1, 2007. ^ Schreier, Jason. (January 4, 2011) Nintendo DS Line Outsells PlayStation 2, Nintendo Says | Game|Life. Wired.com. Retrieved on 2013-08-23. ^ Frum, Larry. "Nintendo to unveil 3-D gaming console". CNN.com. Retrieved September 6, 2013. ^ McWhertor, Michael (January 29, 2013). "Nintendo DS games coming to Wii U Virtual Console". Polygon. Retrieved January 30, 2014. ^ Phillips, Tom (June 4, 2014). "Nintendo's first DS title for Wii U now available in Japan". Eurogamer.net. Retrieved June 4, 2014. ^ "Can the Nintendo DS or DS Lite Play Game Boy Games? | Nintendo DS Family | Nintendo Support". en-americas-support.nintendo.com. Retrieved March 17, 2018. ^ "Nintendo - Customer Service | Game Boy micro - Frequently Asked Questions". www.nintendo.com. Retrieved March 17, 2018. ^ "Dual-slot mode". Retrieved November 1, 2014. ^ Vuijk, Rafael (October 11, 2006). "First Nintendo DS cartridge information". Dark Fader (Rafael Vuijk). Retrieved February 10, 2010. ^ Ni no Kuni: The Another World was the first DS game to use a 4-gigabit card "GoNintendo: Level 5's press conference – massive info roundup (Fantasy Life announced, Ninokuni's massive DS cart, and much more!)". ^ Adam Riley (July 15, 2007). "E3 2007 News|Archaic Sealed Heat (Nintendo DS) RPG Details". Cubed3.com. Retrieved November 4, 2007. ^ Sara Guinness (June 16, 2006). "MechAssault DS Developer Diary". IGN. Archived from the original on May 9, 2007. Retrieved November 4, 2007. ^ a b "GBATEK – GBA/NDS Technical Info". Retrieved 30 December 2016. ^ "What Is the Difference between the Nintendo DS and the Nintendo DS Lite? | Nintendo Support". en-americas-support.nintendo.com. Retrieved 2019-01-22. ^ "DSi XL Was Once DS Lite XL". Retrieved January 2, 2010. ^ a b "Corporate Management Policy Briefing / Semi-annual Financial Results Briefing". Minami-ku, Kyoto: Nintendo. October 30, 2009. pp. 9–10. Retrieved November 9, 2009. ^ Tor Thorsen (October 29, 2009). "DSi XL hits US & EU Q1 2010, DS sales top 113 million". GameSpot. San Francisco: CBS Interactive. Retrieved October 29, 2009. ^ Christopher Dring (October 29, 2009). "Nintendo reveals DSi LL". MCV. United Kingdom: Intent Media. Retrieved November 9, 2009. ^ Furber, Steve. ARM System-on-Chip Architecture. p. 344. ISBN 0-201-67519-6. ^ "Nintendo DS and Nintendo DS Lite – Wireless Router Information". Nintendo – Customer Service. ^ "Take Control" (PDF). Twvideo01.ubm-us.net. Retrieved 22 September 2018. ^ "A guide to homebrew development for the Nintendo DS". Retrieved July 16, 2009. ^ "Nintendo DS ni-fi protocol information". Web.archive.org. February 2, 2009. Archived from the original on February 2, 2009. Retrieved September 11, 2012. ^ "- Nintendo – Customer Service – Nintendo DS – Charging the Battery". nintendo.com. ^ "Nintendo DS Fitting Guides, NDSL Repair Guides". Consolewerks.co.uk. Archived from the original on November 9, 2012. Retrieved September 11, 2012. ^ "Nintendo Online Store". Retrieved April 2, 2006. ^ "Giving gamers two windows to the Web: The Opera Browser for Nintendo DS" (Press release). Opera Software. February 15, 2006. Retrieved April 2, 2006. ^ Berit Hanson (February 16, 2006). "Opera for Nintendo DS". Berit's Blog. Retrieved July 3, 2006. ^ "Mark your calendars: Opera announces Nintendo DS browser release date in Japan" (Press release). Opera Software ASA. June 21, 2006. Retrieved June 21, 2006. ^ Chris Playo. "Japan: Nintendo DS Press Conference". NintendoDS Advanced. Archived from the original on May 16, 2009. Retrieved April 2, 2006. ^ Craig Harris (March 7, 2007). "GDC 2007: Nintendo DS Browser US Bound". IGN. Retrieved September 19, 2007. ^ "Nintendo DSi Browser at Nintendo :: Games". Nintendo. Retrieved June 19, 2009. ^ Brian Ekberg (April 14, 2008). "Guitar Hero: On Tour First Look". GameSpot. Retrieved May 26, 2008. ^ "Mario Kart, Nintendo Wi-Fi Launch". IGN.com. November 15, 2005. Retrieved May 19, 2014. ^ . Translation. "The Zen of Wi-Fi". Famitsu (in Japanese). March 2006. Retrieved November 13, 2015. ^ "Nintendo Wi-Fi Connection service for Nintendo DS and Wii to end in May". Nintendo.com. February 26, 2014. Retrieved May 20, 2014. ^ "What Are Nintendo DS and DSi Cards?". Nintendo DS Cards. June 27, 2010. Archived from the original on February 3, 2011. Retrieved September 23, 2010. ^ "ニンテンドーDSの違法コピーにご注意！" (in Japanese). The Chosun Ilbo. December 11, 2007. Archived from the original on February 7, 2010. Retrieved September 10, 2008.